These new stem cell lines will allow researchers to "turn back the clock" and observe how Alzheimer's develops in the brain. These reconstituted Alzheimer's cells will also provide a platform for drug testing on cells from patients that were definitively diagnosed with the disease. Until now, the only available method to definitively diagnose Alzheimer's disease that has been available to researchers is examining the brain of deceased patients. This discovery will permit scientists for the first time to compare "live" brain cells from Alzheimer's patients to the brain cells of other non-Alzheimer's patients. This advance, published today in Acta Neuropathologica Communications , shows that disease-specific iPS cells can be generated from readily available biobanked tissue that has not been cryoprotected, even after they have been frozen for many years. This allows for the generation of iPS cells from brains with confirmed disease pathology as well as allows access to rare patient variants that have been banked. In addition, findings made using iPS cellular models can be cross-validated in the original brain tissue used to generate the cells. The stem cell lines generated for this study included samples from patients with confirmed Alzheimer's disease and four other neurodegenerative diseases. iPS cells are typically generated from a skin or blood sample of a patient by turning back the clock of adult cells into pluripotent stem cells, cells that can become any cell type in the body. While valuable, iPS cells are often generated from patients without a clear diagnosis of disease and many neurodegenerative diseases, such as Alzheimer's disease, often lack specific and robust disease classification and severity grading. The challenge to this approach is that the majority of biobanked brain tissue was not meant for growing live cells, and thus was not frozen in the presence of cryoprotectants normally used to protect cells while frozen. 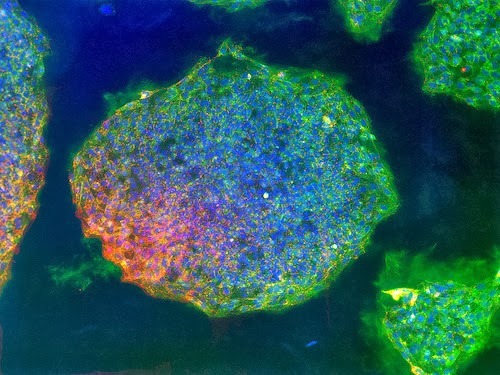 NYSCF scientists in collaboration with CUMC scientists have shown that these thousands of samples can now be used to make living human cells for use in disease studies and to develop new drugs or preventative treatments for future patients. The New York Stem Cell Foundation (NYSCF) is an independent organization founded in 2005 to accelerate cures and better treatments for patients through stem cell research. NYSCF employs over 45 researchers at the NYSCF Research Institute, located in New York, and is an acknowledged world leader in stem cell research and in developing pioneering stem cell technologies, including the NYSCF Global Stem Cell ArrayTM. Additionally, NYSCF supports another 60 researchers at other leading institutions worldwide through its Innovator Programs, including the NYSCF – Druckenmiller Fellowships and the NYSCF – Robertson Investigator Awards. NYSCF focuses on translational research in a model designed to overcome the barriers that slow discovery and replaces silos with collaboration. More information is available at http://www.nyscf.org.